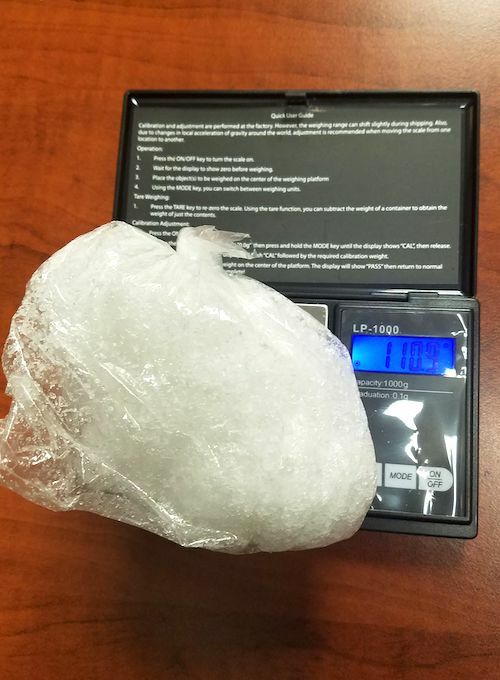 PRICHARD, W.VA. — Sheriff Rick Thompson stated that the Wayne County Sheriff Drug Enforcement Unit seized a quarter of a pound of Crystal Methamphetamine during a traffic stop in the Prichard area on Jan. 26. Sheriff Thompson said that while the Wayne County Sheriff Drug Enforcement Unit was doing drug interdiction on US Rt 52 they responded to a bolo of a reckless driver traveling south on 52. The Wayne County Sheriff Drug Enforcement Unit got behind the vehicle and observed the suspect vehicle pass a car while a vehicle was approaching in the north bound lane. The Wayne County Sheriff Drug Enforcement Unit made a traffic stop on the vehicle and called for the Sheriff’s Department K9, Nitro, who immediately indicated on the car. During a search of the driver, Dominique Dogan of Charleston, a large baggie of Crystal Methamphetamine was found in Dominque’s underwear. Dominique is charged with Conspiracy to Distribute more than 50 grams of Methamphetamine, Possession with Intent to Deliver, and Pseudoephedrine Altered. Sheriff Thompson stated that he appreciates tips from the public and that the tip this evening helped take more than 1,000 doses of Methamphetamine off the streets.